Samurai Jack is a retro show that a lot of people like. It’s known as a classic and it probably rivals famous action cartoons like the Powerpuff Girls back in its prime. Unfortunately, it infamously ends with nothing actually being resolved so it can be a pretty disappointing way to end the series. It’s a good title, but the problem lies in the fact that most episodes are filler. Because of that, some episodes are really good and some are downright bad. It’s good to check out, but you’ll probably want to skip some of the filler episodes that couldn’t stack up to the rest. The plot of the show is that a demon by the name of Aku has enslaved the planet. Samurai Jack’s parents (and effectively the whole planet as collateral) were taken from him by Aku and he has trained his whole life so that he can get some payback. Just when he was about to defeat Aku, Jack is sent to the future. Aku’s reign is now absolute and defeating him will be difficult. Still, Jack shall never give up and he will find a way to stop Aku! Even if it takes a lifetime. The show made it through 4 seasons, but that doesn’t help its case as much as you would expect from the average show because of the fact that over 90% of the series is filler. There are good episodes and then there are bad ones. The final 3 episodes of the series are all pretty bad for example while you may have random ones in season 3 that are very good. It’s something that you have to take on a day by day basis and it can get pretty tricky. It’s why I don’t recommend such a format for any show. It is intriguing to see just how big the planet is though. Jack comes across countries from all sorts of different time periods. A lot of them just don’t make sense when compared to others and that’s one of the things that makes the planet so much fun. One corner may still be in the 40’s while another one has tech from the year 3000+. 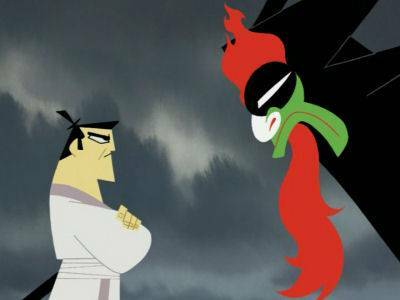 It’s too bad that everyone doesn’t unite to stop Aku, but I have a feeling that it could have happened if the show ever got an ending. It was practically leading up to that as Jack went around the world helping people. Samurai Jack is a pretty good protagonist. You could even say that he is great although he doesn’t always look as good as you would expect depending on the episode. He is tricked into losing his memory at one point and he does tend to let his guard down around female villains. Jack is an honorable swordsman so he never actually lets romance get to him, but he doesn’t try as hard to escape it as he should. His swordsmanship skills are top notch and Jack has been shown to take on whole armies in the past. It’s rare that he ever loses a fight and Jack always gives the match his best effort. It’s hard not to like such a fighter and the show likely wouldn’t be half as good without him. Once in a while, an episode won’t be from his point of view so it’s always fun to see how he looks from an antagonistic standpoint. There are at least 2 episodes where he is the main villain and those are always sad since the “heroes” usually have some kind of reason as to why they need to defeat him. Of course, they’re doomed so it is always for naught. Aku is the main villain of the show and he is the kind of villain who isn’t for everyone, but will certainly get some fans. I am not a big fan of the villain. Aku can be pretty funny considering that he rules the planet with an iron grip, but that’s about it for qualities that I like. His goals are pretty generic and his “invincible” abilities never actually seem that great. It’s a little hard to see how he managed to defeat all of the heroes on the planet. Depending on the episode, he can be a cruel tyrant or a misunderstood anti-hero. He just doesn’t take anything seriously which is why his attitude tends to shift a lot, but the heroes can’t forgive his actions. He is still a villain no mater how heroic he may seem at times. The Scotsman is really the only recurring member of the supporting cast in the show and I believe that he only appears in 3 episodes. It’s possible that it’s more like 4-5. Out of 52 that’s not bad….I suppose. He is Jack’s rival and a nice ally to have. He’s definitely not as powerful as Samurai Jack, but he gets by pretty well on his own. He has a machine gun and he’s a very physical fighter. His accent makes him easy to identify in a crowd. The Scotsman is very charismatic and it was fun having him in the show. I definitely wouldn’t mind seeing more of him. One factor that does hurt the show quite a bit is the animation. I really don’t care for the style that is used here and it makes the show appear to be decades older than it actually is. You can basically see most of the animation shortcuts that are used without any effort. Considering that this was airing back during the good ole days of Pokemon, we know that the animation could have been significantly better. As it stands, the fight scenes were very good at their height, but we know that they would have been even better with the proper animation techniques behind them. It’s the main reason why this show wasn’t a 7 and who knows, an 8 may not have been out of the question with better animation although it would have been a bit of a stretch. Due to its episodic nature, the series falls into many holes. Aside from the romance one, we also have the animal violence tropes that we always try to avoid. This happens in quite a few episodes and animals are enslaved in another. It’s the kind of thing that you never want to see in a show, but it typically pops up as a show gets more episodes. Whenever that happened it would be pretty sad and I would just hope that the show would get better next time. On the bright side, there are many great episodes to counter those. Typically, the duel episodes are the best one. There are probably around 10 or so of those where the fight gets to last for nearly the whole episode. The train duel and the battle against the guardian of the portal come to mind, but there are many others. Even Jack’s battles against Aku and the Cyborgs tend to be pretty long. There are also heist episodes like one where Jack has to stop a James Bond figure from looting a pyramid before him. Once again, that’s why having every episode be a stand alone with the occasional two parter is super risky. The quality of each episode really varies and ultimately this helps to keep it from the elusive 7. There are enough episodes that simply aren’t very good, which is enough to keep it from that spot. At it’s best, Samurai Jack is 8 star worthy and at its worst it’s probably a 3-4. I certainly would have liked more of an ongoing plot here. The soundtrack really varies and it’s probably one of the most diverse ones that I’ve ever heard. It definitely gets a 5 star rating there since it’s usually pretty enjoyable. The themes tend to fit the episodes and they also help with the fights. The show is definitely more dramatic than your average cartoon and the fights can get really intense. The musical themes that accompany them help to solidify this image and it really helps the show. There’s not a whole lot more to say about the show. It’s a good action show and it tries its hand at many different kinds of stories. It tends to feel pretty high quality and that’s always a good thing. It’s too bad that we never got a real ending, but there’s always a chance that we will get something at some point. We just have to keep on waiting and hope that they do come through with a new film or give us the ending via the comics. 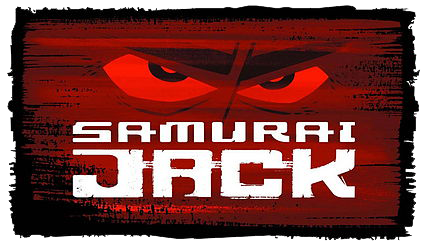 Overall, Samurai Jack is a pretty fun show that really gets hurt by the amount of filler in it. It’s made that way though so you could also just not think of them as filler episodes and just consider the series as a bunch of short stories. There’s not necessarily much of a timeframe to be noted so the stories can take place at any time. It’s a show that feels like it’s not meant to ever end and you just get to see Jack go on all kinds of adventures. Some are good and some are not. If you’re looking for a good action show then I definitely recommend checking this one out. The fight scenes can definitely be really good and it has a good soundtrack. Updating the animation would certainly help its case a lot though. We’ll see if you like Samurai Jack as a character as much as I did. This entry was posted in 6 Star TV Shows, Reviews, TV Show Reviews, TV Shows and tagged Action, Action Show, Aku, Fighting, Review, Samurai Jack, TV Show, TV Show Review by dreager1. Bookmark the permalink. Samurai Jack is awesome! It’s one of the shows I grew up with, it’s fantastic and Jack is just crazy. I really want to watch it all, I’ve not managed to finish it since I watched random episodes when I was a kid. However, since it’s on netflix, I think I’ll get my otaku on lol. Yeah, that would definitely be a good idea. I took a while to watch it myself, but it was such a classic that I had to start it. I watched it weekly on Toonami and then saw the final episodes online when the channel let it go. I’ll be looking forward to seeing your take on it. The battle episodes are definitely great and Jack is a stellar main character.